It's time, once again, to celebrate one of my favorite foods. Yes, this coming Saturday, May 13th, is International Hummus Day and it totally makes me happy that hummus is so widely appreciated. 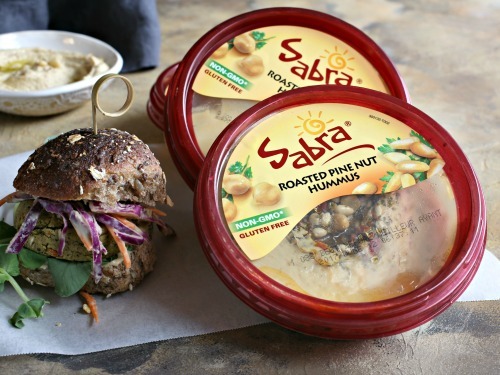 Sabra hummus is one of those staple items you're likely to find in my refrigerator at all times. It's my healthy impromptu snack and my preferred sandwich spread. It's also what I serve when people come over. Just add some pita chips and sliced vegetables and everybody digs in. Because it's so versatile, though, it's a great ingredient for an "unofficial" meal. You know the one I mean - when it's not lunch and it's not dinner but it's definitely time to eat something. Yup, that "meal." 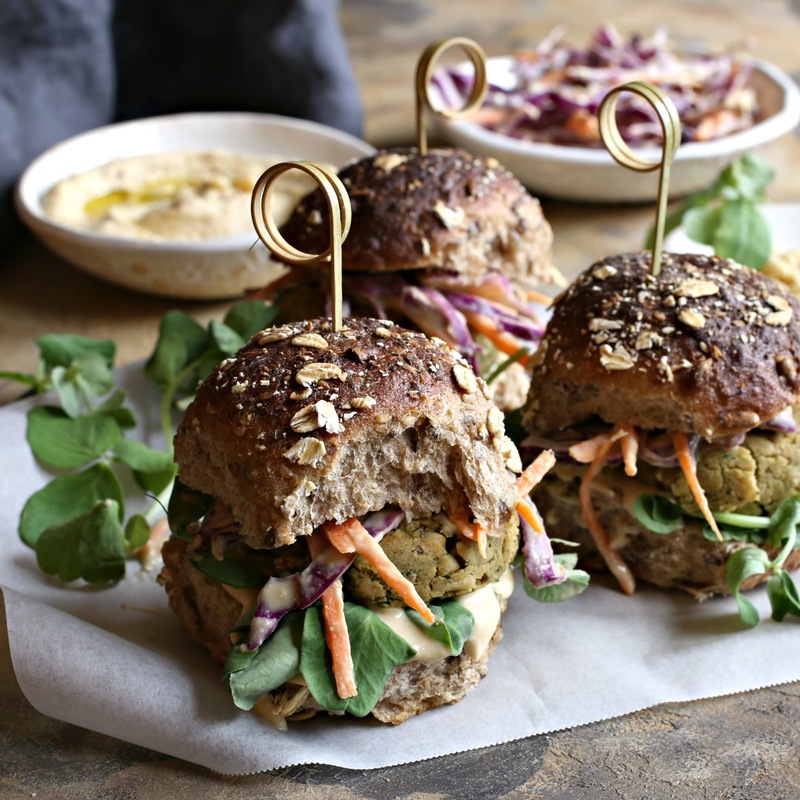 These little falafel baked patties are oven baked so big on flavor, low on calories and perfect for serving on mini whole grain rolls with an extra dollop of hummus on the bottom. 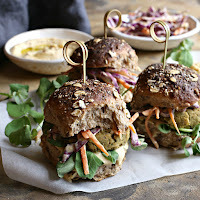 Top with an easy slaw made with a hummus dressing and you have a perfect little bite. Enjoy! Add the chickpeas, pine nuts, sesame paste, olive oil, cilantro, cumin, baking powder, garlic powder, black pepper and salt to a food processor and pulse until the mixture is combined. It doesn't need to be totally smooth. Scoop balls approximately 1 1/2 - 2 oz. and place on a baking sheet lined with parchment paper. Press down lightly with the palm of your hand to flatter them a little. Bake for 12 minutes, flip the patties and continue baking for an additional 12 minutes. Make the coleslaw by combining the hummus, lemon juice, water, salt and pepper in a bowl. Toss with the shredded cabbage and carrots and let stand for about 15 minutes for the vegetables to soften. 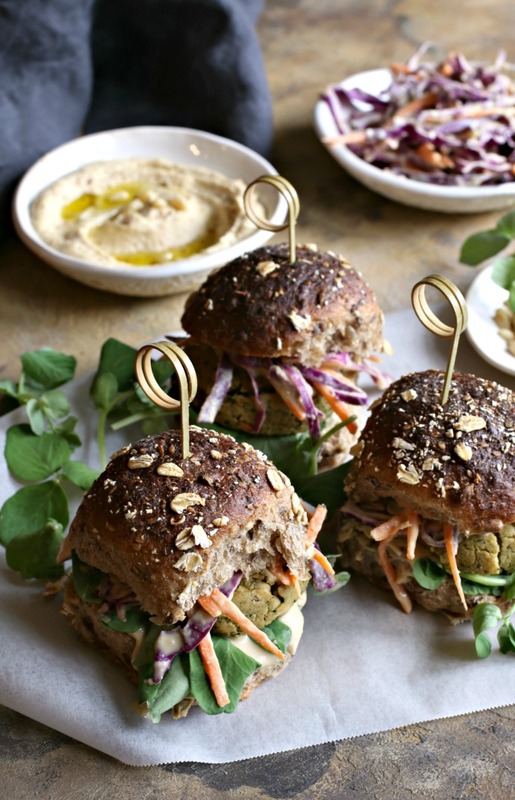 Spread mini whole wheat rolls with a tablespoon of hummus, add a falafel patty and top with a tablespoon or two of the coleslaw. This recipe is sponsored by Sabra. Thank you for supporting the products I love and use in my kitchen. 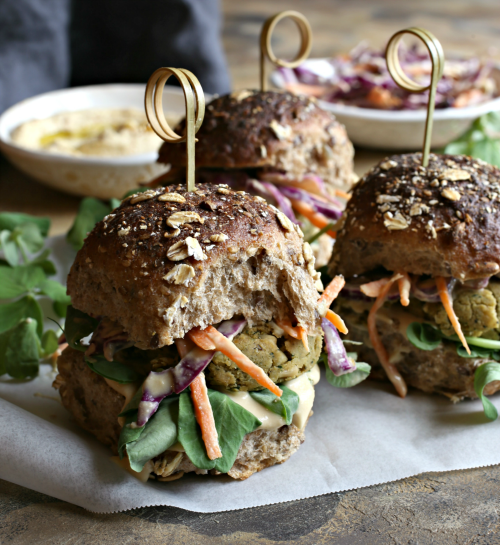 Perfect little sliders for lunch! I bet these are awesome!